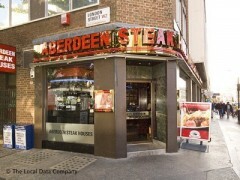 About: Aberdeen Steak Houses is part of a large chain with outlets all over London, offering 'British' food but as the name suggests with an emphasis on beef - catering well for children. Visited on the 9th November 08. Food was only warm and service was a bit poor. Not keen to pay over £50.00 for two 8oz steaks two drinks, and chips come as extras.